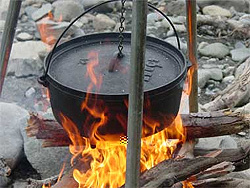 One of the joys of outdoor camping is cooking as they did in the Middle Ages —over an open fire. Whole meals can be cooked in one pot with delicious results. You can even bake pies and cakes in a Dutch oven just as you would in your own kitchen. Cooking fires can be made from dead branches and twigs or bagged charcoal. The best heat for camp cooking comes from the red hot embers of a hard wood fire that has been burning for more than 2 hours. Make a hearth (cooking area) near the fire by clearing away the brush and flamable material to create a hard smooth surface. You can lay down fire brick if you like to help insulate the hearth. Move hot coals to the hearth with a snub-nosed shovel and place your three-legged Dutch oven on the coals. If you have a flat bottomed Dutch oven, place an iron trivet under the pot to raise it above the coals. A windscreen of wood or metal placed around the hearth will not only shield the hearth from the wind but will serve to reflect heat back to the cooking area. Always observe your local fire safety laws and campfire etiquette. For your own safety, wear fireplace gloves when moving coals with tongs. To boil, place your cast iron pot about 8" above or beside the flame. If beside, place a metal windbreak beside it to reflect heat. To simmer, move the pot further from the flame or to a small bed of embers (live coals) after the pot comes to a full boil. To fry in an iron skillet, place it on an iron trivet over a bed of hot embers. I use iron plant stands of various heights. The skillet can smother the coals if it is too close. Leave room for air circulation. Add fresh embers as needed to the bed of coals. To broil in a Dutch oven, put embers on the lid instead of under the pot. To bake in a Dutch oven, build a ring of embers around the pot and cover the lid with embers. How many embers and how long is a matter of guessing, testing, and learning from experience since the number of coals needed changes with the weather, the wood type, the size of the pot, and the food being cooked. As a rule of thumb, remember, "If you can't smell it, it's not done; if it smells done, it's done; and, if it smells burnt, it's burnt." To bake food without a pot, place onions, squash, bell peppers, eggplant, and apples about 8 to15 inches from the fire and turn every 10 to 15 minutes until done. You can bury sweet potatoes or eggs in ash and embers to cook slowly overnight. You don't even need to wrap them in foil. When you buy cast iron pots and pans they are not ready for use until they are seasoned (unless they are pre-seasoned). Seasoning creates a natural Teflon-like coating that prevents rusting and keeps food from sticking. Follow the care instructions that come with your cast iron pans before cooking. Here is more information on How to clean and season old Dutch ovens. 1 lb greens like swiss chard, kale, collards, mustard, endive, chicory, etc. Preheat a large Dutch oven over hot embers. Heat oil in the Dutch oven. Season chicken pieces and brown all sides in the hot oil, remove chicken to a platter. Arrange the carrots in the bottom of the Dutch oven to support the chicken. Add rosemary and green onions. Add the wine and enough of the water to barely cover the carrots. Place the chicken on top of the carrots. Cover and return to the fire. Build a ring of embers around the pot and cover the top of the lid with embers. When the pot comes to a boil, reduce the heat by removing half of the coals from the ring and lid and letting it simmer for 30 minutes. Carefully lift off the lid with a lid lifter and set on a trivet to keep it from picking up dirt or ash. Add the greens and return the lid to the pot. Cook for 20 to 30 minutes more. Cut into a thick piece of chicken to see if it is done. It should be cooked all the way through but not falling off the bone. Use tongs to remove the greens, chicken, and carrots. Arrange on a platter or in serving bowls and cover to keep warm. Ring the Dutch oven with more hot coals. Bring stock to a boil and reduce by half then add cream to make gravy. Thicken with breadcrumbs. Serve with crusty bread and herb butter. Set out butter until it is room temperature. Mix herbs and butter together by hand. Place in small tub and refrigerate for a couple days before serving to meld all the flavors. (DA*ree*ohls) 15th century fruit custard pie. Pies and Dutch ovens were made for each other. "It's simple as pie" is a homily for a reason. You can make it even simpler with a store bought pie crust. When I demonstrate pie making everyone is impressed with how easy it is to roll out the dough when using a flour dusted pastry cloth (cotton canvas napkin 17" x 17"). This keeps the dough from sticking and is more "period" than wax paper. Period pie crusts were made with less fat and salt than this recipe and could stand on their own without a pie pan. However, they were not as pleasant to eat. Mix salt into the flour. (If you are using salted butter or margaine, reduce salt to ¼ tsp.) Cut the cold fat into the flour with a pastry blender or use two knives to "slice" the ingredients together until the lumps are the size of spit peas. Sprinkle with the cold water and mix into a dough with your hands. Do not overwork the dough. Chill the dough for 10 minutes in an ice chest. Turn out on a floured pastry cloth. Flour your hands and the rolling pin. Pat the dough into a small circle, about 5" diameter. Quickly roll the dough into a circle about 12" in diameter with a rolling pin. If you don't have a rolling pin, use a straight sided beer bottle. Fold the pie dough lightly in quarters, transfer to pie pan, and unfold. Cut off excess crust and pinch a fluted border around the edge. Add filling and bake. Preheat a Dutch oven. Wash, drain, and pat dry the berries. Place berries in the bottom of the pie crust. Whip eggs, milk, cream, and sugar with a whisk for 2 minutes and pour over the berries. Dust with spices. Place the pie on a trivet in the bottom of a pre-heated Dutch oven. If there is not room for your hands to lower the pie in without sloshing, place the pie on a length of foil long enough to allow you to lower the pie into the hot Dutch oven. Bake for 10 minutes with lots of heat on top and underneath, then remove some of the coals and continue baking with medium heat for about 45 minutes. The pie is done when it smells really good, the top is all puffed up, slightly browned, and a knife comes out clean. Allow to cool completely before serving. Variations include substituting half 'n' half or cream cheese for the cream or substituting pitted and sliced cherries for the berries in the filling. Be creative. I've included another variation for Fall and Winter fruits in this Dec 09 article. Search on campfire cooking and you will find hundreds of great sites and books. Here are a couple of my favorites. Any medieval recipe can be made in a camp kitchen. Here are some very good medieval cooking websites. If you want to add this article to your list of favorites or email it to a friend, please use this permanent URL, https://stores.renstore.com/-strse-template/0807A/Page.bok. Permission is granted by the author to quote from this page or use it in handouts as long as you include a link back to Renstore.com.